Do Dogs Try to Hide Theft of Food? Will your dog steal food even if you can see or hear the theft take place? Two new studies investigate whether dogs can take a human’s perspective in deciding whether to take a piece of forbidden food. Earlier work has shown that dogs and other animals seem to have an awareness of human visual attention. For example, Gácsi et al (2004) found that dogs were more likely to beg from an attentive rather than an inattentive human. However, it is not known if dogs understand what a human can see or hear. One way to test this is to see how dogs respond to different light levels. Juliane Kaminski of Portsmouth University designed three experiments that took place in a room with the windows blacked out. Dogs wore a reflective collar to make it easier to see them, and an infrared camera recorded what happened. The dogs first had to pass a pre-test in which they were taught to leave a piece of food on the ground for sixty seconds. The experimenter put food on the ground and told the dog it was forbidden. Then she sat on the floor, looking at a spot on the wall, for two minutes. The lighting was set up in one of four ways: both food and experimenter in the light, both in the dark, only food or only the experimenter in the light. After the time was up, the experimenter got up and took the food (if it was still there). We might think of rewarding the few dogs that didn't steal the food, but that doesn't seem to have fit with the design of the experiment. Each dog took part in each of the four conditions four times and received supplementary training that the food was forbidden at various stages. Dogs were significantly more likely to eat the food when the room was dark. Dogs took the food more quickly when it was in the dark, but whether or not the human was in the light did not affect the results. A second study in which the experimenter left the room showed that dogs took the food almost every time, and took it more quickly when the food was in the light. In a final experiment similar to the first, the areas of the room that were lit up changed without affecting the overall level of light in the room. This time, if the lighting focussed on the food then dogs took longer to get it. This shows that dogs prefer to steal food if it is in the dark. The sight of a human does not put them off, but if the food is lit up they delay taking it. This could mean they understand that if they can see the food, then the human also can see it. Another approach to studying whether dogs can take a human perspective is described in a new paper by Juliane Bräuer of Leipzig University. Instead of turning the lights out, clear vs opaque materials were used to test dogs’ use of visual information, and a second study tested the effects of noise. In all cases, dogs were first trained to remove food with their paw from a tunnel. The food was placed further and further back in the tunnel, and once dogs would get it from the far end they were ready to begin the study. In the first experiment, one side of the tunnel was clear and the other side was opaque. During the training, dogs were switched between clear and opaque tunnels so they would not have a preference for one or the other. The experimenter began by placing a piece of food in the tunnel in full view of the dog, and giving an instruction. In the first condition, they told the dog ‘No’, the food was forbidden, and then stood in a set location where they could see the tunnel but the dog could not see them. In the second condition, they told the dog ‘No’, and then left the room. In the final condition, they told the dog that it was allowed the food, as a test of motivation. The dogs’ behaviour was videotaped and analyzed in terms of the length of time before the dog approached the tunnel, and the side which it approached. The results showed no differences between the conditions, and no preference for either the opaque or clear side of the tunnel. So the dogs did not act differently in the case where the experimenter could see them, but they could not see the experimenter. This suggests they took an egocentric point of view, unlike in Kaminski’s study. In the second experiment, auditory information was used instead. On one side of the tunnel there was a flat mat that did not make noise, and on the other side there was a mat made of crinkly material that was noisy when the dog trod on it. The dogs were trained using both mats, so they would not have a preference for one or the other. Again there were three conditions: the dog was told ‘no’ and the experimenter stood in a set location with their eyes closed; the dog was told ‘no’ and the experimenter left the room; or the dog was told the food was allowed. This time, dogs showed a clear preference for the side of the tunnel with the silent mat when the experimenter was in the room. In the other two conditions, they had no preference for the silent or noisy side. The authors conclude that “when taking forbidden food from a tunnel, the dogs preferred to be silent, but not to be hidden.” It seems the dogs took an egocentric approach in the visual condition, assuming that because they could not see the experimenter, she could not see them. But in the auditory condition, they tried to hide their approach by choosing the quiet side of the tunnel. Interestingly, this has some similarities to studies with chimpanzees and scrub jays, in which they were shown to avoid making noise when they find a food source. One explanation is that because the dogs could hear the noise themselves, they could hear what the human could hear; this made the problem easier to solve than in the visual experiment. The set-up of the experiment was complicated, with plywood walls around the tunnel, so it is possible they did not fully understand the visual condition. Overall these studies suggest that in some circumstances a dog seems to understand a human perspective, but more research is needed because the design of the study seems to affect the results. 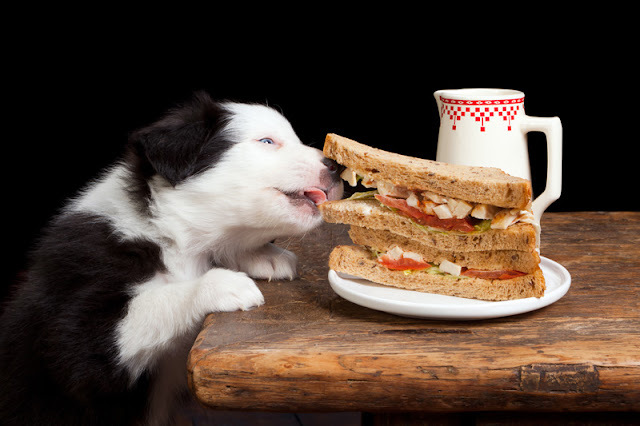 Has your dog ever stolen food? You might also like Do dogs or hand-reared wolves pay more attention to people?